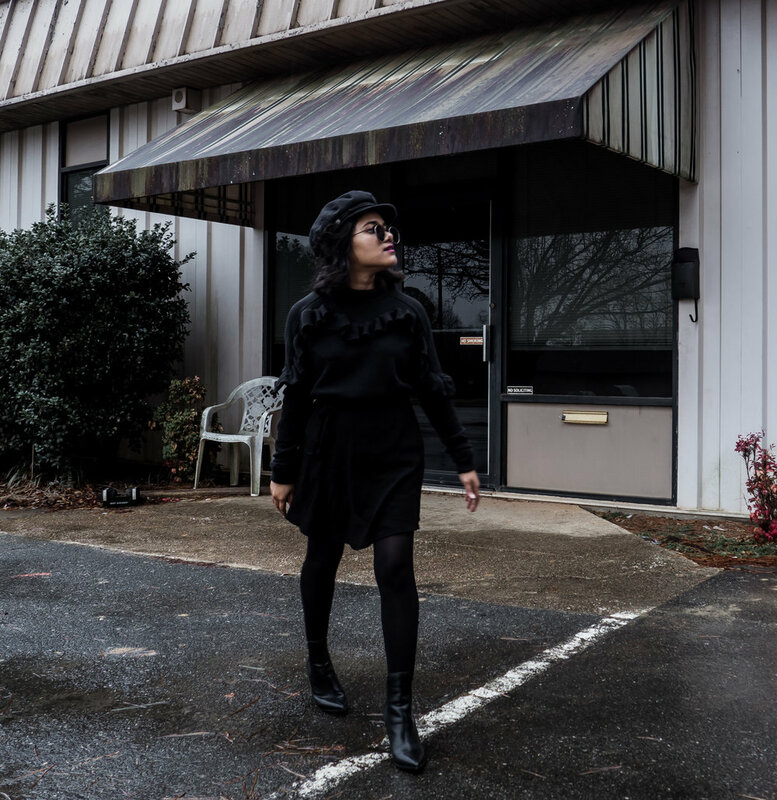 After a month break from blogging, the only way I wanted to resurface is by talking about Black Panther and providing a bit of all black outfit inspiration. I'm still mourning my vacation time any way, so I think it's pretty appropriate right now. All black with a bit confidence takes more creativity than you think. I thought about what really one can add to stand out a little more. You have to think about the silhouette and stance behind the color as well. The first way I decided to do this is by highlighting a high waist. If you happen to have a black skirt (non-pencil preferrably) and a slightly ruffled sweater, you can pull off a confident and chic look in black. I really love how ruffles add a layer of depth to a look. Add a pair of killer pointy boots and try a baker boy hat to add more black and give you a polished off accessories. The only color I added was a dark lip color. A bold lip has a way of making me feel more sure of myself and I needed that to pull off a stronger all black outfit. Recently, I watched Black Panther, as did the rest of the world, and was inspired by the outfits as well as the powerful themes the movie invokes. You just feel a little more sure of yourself after you leave the theater and ready to take on the world. And I definitely want to book a trip to Wakanda when it becomes a real city.